Dust on April 25 and April 28 forced the closure of I-10. A rescue truck and a DPS patrol car were totaled by semis. Trucks sprayed a field owned by David Turner to keep dust down along Interstate 10 near San Simon last May. 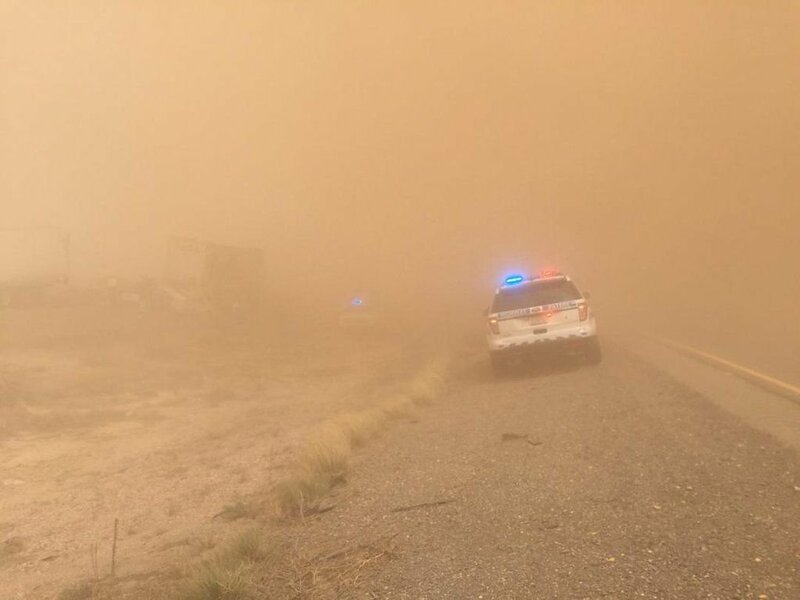 State air-quality officials have asked the Arizona attorney general to enforce “fugitive dust” laws against a Cochise County farm blamed for dust storms that led to three multiple-vehicle crashes on Interstate 10 in April. The interstate was closed eight times in April and May when dust reduced visibility adjacent to David R. Turner’s Agrigold Farms near San Simon east of Tucson. The state is also seeking reimbursement for the nearly $600,000 in taxpayer money spent to solve the problem. “ADEQ completed its investigation and developed its case regarding the company and fugitive dust control regulations and has moved to the enforcement phase with the intention of collecting all appropriate penalties and other monies legally due to the state of Arizona,” she wrote. State law requires farmers to take “reasonable precautions to prevent excessive amounts of particulate matter from becoming airborne,” but the statute is seldom enforced outside the counties that are under federal orders to meet air-quality standards. Cochise County is not one of them. The action is extremely rare for the state Division of Air Quality. The Star found no state enforcement of the statute in records dating to 2000. Timothy Franquist, director of the air-quality division, told the Star in July that he had never seen it enforced. He also called the Turner farm “an extreme example” of blowing dust. Turner and the state signed a consent order on May 16, in which Turner promised to take immediate action. The following day, as winds continued to blow dust from Turner’s denuded parcel, the state stepped in. The Arizona Department of Transportation (ADOT) hired water tankers and ADEQ hired a contractor to treat the 640-acre parcel with a chemical stabilizer. It said it would seek reimbursement and could levy fines up to $10,000 a day. The Department of Environmental Quality later reported it spent $288,000. ADOT spent $308,000. The Arizona Department of Public Safety spent $31,000 on personnel, vehicle use and overtime pay during the dust events. DPS troopers guided motorists on a 108-mile detour through Safford to avoid the dust on the interstate. Turner, who made his fortune in the dried-fruit-and-nut business in Arizona before devoting his life to a faith-healing ministry, had cleared the land in preparation for planting groves of pistachio trees. He has since moved his David Turner International Ministries to the Atlanta suburb of Buckhead. Turner did not immediately respond to a request for comment left on his voicemail Friday afternoon. His lawyer, Phillip Fargotstein, of Fennemore Craig in Phoenix, said Friday that he could not comment without his client’s permission. Contact reporter Tom Beal at tbeal@tucson.com or 573-4158. Follow on Facebook or @bealagram on Twitter. ADOT will place sensors, warning signs and reduced speed signals along a 10-mile stretch of Interstate 10 between Eloy and Picacho Peak. Death toll higher if you include health effects. An emergency solution to blowing dust that forced multiple closures on Interstate-10 near San Simon was a rare action by a state agency that has limited authority to regulate agriculture. Work is part of project to remove part of cliff to keep it from falling onto highway, ADOT says.